lying under the table together with you now? In early live versions of this song, it was a rabbit in dungarees, rather than a small child, who got his fingers trapped in the doors of the Paris metro. 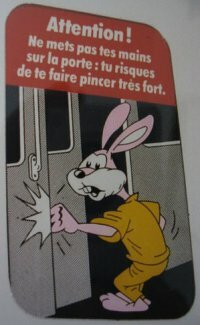 This was presumably derived from the sign below, which warns child to keep their fingers away from the metro doors. The sound of children singing during the intro of the studio version is sampled from the 1958 LP Music for Children by Carl Orff & Gunild Keetman. The sample is treated with a lot of echo, rendering most of the words inaudible, but they are: "My little pony needs new shoes, how many nails must I use? My little pony needs new shoes, how many nails must I use? One, two, three, tie him to a tree, let him have a bag of hay then he will not run away. My little pony needs new shoes..."